PLAY for a Cure’s ‘Day on the Green’ is back. 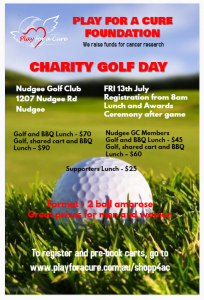 After such a successful inaugural day we are working hard with Nudgee Golf Club and our supporters to make this year even better! All funds raised will (as usual) go to support critical cancer research programs. Get in quick as the positions fill up extremely quickly and we don’t want you to miss out. Click here to secure your tickets. There will be many great prizes on offer for both men and women participants on the day. The format will be a 2 ball Ambrose. The 2 person teams can be organised in any form either with both men or by both women or mixed, it doesn’t matter. Anyone can register to play and any singles will be paired off on the day. Registration is from 8am at the Course and after the game we will enjoy a BBQ lunch with the awards ceremony. At lunch, we will be hosting a raffle where some great prizes will be available. This entry was posted on Friday, May 18th, 2018 at 10:36 am and is filed under Events, News. You can follow any responses to this entry through the RSS 2.0 feed. You can leave a response, or trackback from your own site.